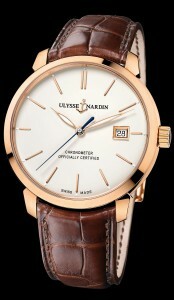 Rose Gold 40mm case, with automatic movement, date, ivory color dial, large second hand, and glass exhibition case back. The visible 22K rose gold rotor is etched with Ulysse Nardin name and anchor logo, available on a elegant crocodile leather strap, with traditional pin buckle. PRICE $13,800 dlrs. To purchase call us 956.687.2981.